My mother and step-father, Jim &Julia Chandler, were the first ICEJ prayer team leaders and part of the development of "the Feast" since its inception in 1980 - and have been referred to by Susan Michael, the US Director of the ICEJ, as "everybody's mom and pop". The Christian celebration of the Feast of Tabernacles has been a vital and central part of the ICEJ’s ministry of comforting Israel ever since - and this year will be no different, terrorists or no! 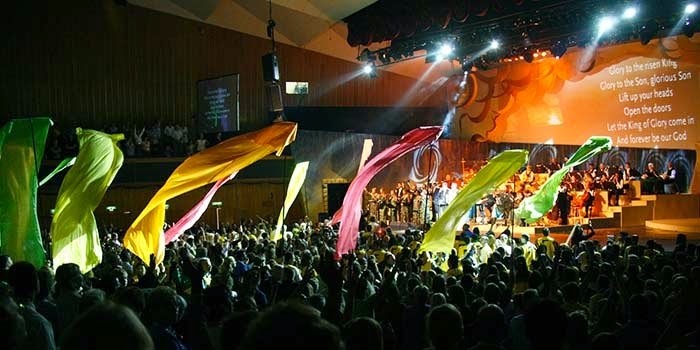 Up to 5,000 Christians from over 100 countries will come to Jerusalem, making the Feast of Tabernacles the largest and most popular annual Christian tourist event in Israel. Pilgrims come to worship the Lord, pray for the peace of Jerusalem, and to bless Israel! This year the ICEJ is hosting a ten-day tour, from October 8-18th, flying from Toronto to Jerusalem, and will include the Dead Sea, Qumran, Ein Gedi, Bethlehem, Masada, Capernaum, Tabgha, Caeserea Philippi, a boat ride on the Sea of Galilee complete with a St. Peter's fish lunch and Jerusalem including communion at the Garden Tomb, the Mount of Olives, the Old City bazaar, the old Jewish Quarter and the Western Wall, a tour of Caiaphas' house and the Citadel Museum - and evenings spent in festive worship of the King of Kings and Lord of Lords! 4 star hotels • Breakfast and dinner daily • Air conditioned bus with WIFI • Licensed English speaking guide • Devotions & Bible-teaching • Entrance fees to sites. Be blessed - go to Israel for The Feast!